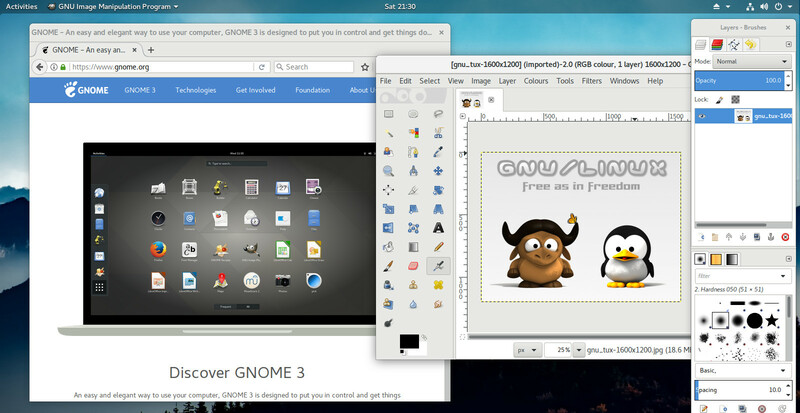 GNU is the only operating system developed specifically to give its users freedom. What is GNU, and what freedom is at stake? We recommend installable versions of GNU (more precisely, GNU/Linux distributions) which are entirely free software. More about GNU below. What is the Free Software Movement? Free software means the users have the freedom to run, copy, distribute, study, change and improve the software. Free software is a matter of liberty, not price. To understand the concept, you should think of “free” as in “free speech”, not as in “free beer”. Developments in technology and network use have made these freedoms even more important now than they were in 1983. Nowadays the free software movement goes far beyond developing the GNU system. See the Free Software Foundation's web site for more about what we do, and a list of ways you can help. GNU is a Unix-like operating system. That means it is a collection of many programs: applications, libraries, developer tools, even games. The development of GNU, started in January 1984, is known as the GNU Project. Many of the programs in GNU are released under the auspices of the GNU Project; those we call GNU packages. The name “GNU” is a recursive acronym for “GNU's Not Unix.” “GNU” is pronounced g'noo, as one syllable, like saying “grew” but replacing the r with n.
The program in a Unix-like system that allocates machine resources and talks to the hardware is called the “kernel”. GNU is typically used with a kernel called Linux. This combination is the GNU/Linux operating system. GNU/Linux is used by millions, though many call it “Linux” by mistake. GNU's own kernel, The Hurd, was started in 1990 (before Linux was started). Volunteers continue developing the Hurd because it is an interesting technical project. Gnuastro 0.9 released: The 9th release of GNU Astronomy Utilities (Gnuastro) is now available for download. Please see the announcement for details. For more news, see Planet GNU and the list of recent GNU releases. Support the efforts on net neutrality in the USA, and in your home country. Defend privacy, and support global copyright reform with LQDN. Fight against software patents: worldwide, and in Europe. The FSF also has sister organizations in Europe, Latin America and India.